You will be asked to fill out some forms with personal details, past health history and presenting problems. Once these have been completed, your chiropractor will introduce themselves and ask some questions to determine that you are in the right place. You may ask your own questions and discuss any concerns that you may have about your visit. Chiropractic can always be of benefit to your health but some health complaints require priority which may be addressed better by our medical colleagues. If you have a problem that requires another type of professional we will refer you to them. Your chiropractor will then conduct a full neurologic, orthopaedic and range of motion examination. When this is completed, your chiropractor will decide whether we can be of assistance and will take your case on. It is here that you may be referred for radiographic examination for further assessment. We refer to a medical radiologist for our films as they are covered by Medicare. The X-rays will be sent to the practice and the 2nd appointment (Report of Findings) is usually scheduled over the next couple of days. With patients in extreme pain these procedures may not be possible so if you are in extreme pain please state that when you ring and we will change our procedures to ensure that you can get as much relief as possible, as fast as possible. Your second visit will be between 20 to 30 minutes. 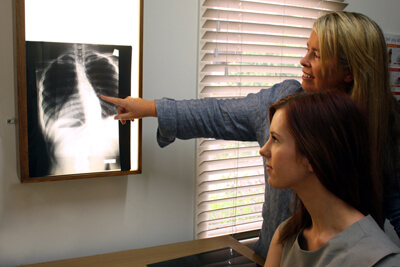 Your chiropractor will go over your X-rays and discuss with you the diagnosis and proposed treatment plan. Each person’s treatment plan is based on their medical history, presenting symptoms and X-Ray findings and thus the frequency of care and duration of each phase of care (relief, rehabilitation and wellness) will vary. Your regular visit will take approximately 10 – 15 minutes in which we will discuss with you any changes that have occurred since your last visit and then check and adjust your spine as is necessary. Schedule your appointment with us today! Walk-ins are welcome, and we accept health fund coverage.